Is feminism dead, as has been claimed by notable members of the media and the academy? Has feminist knowledge, with its proliferation of methodologies and fields, been purchased at the price of power? Are the conflicts among feminists evidence of self-destructive infighting or do they herald the emergence of innovative modes of inquiry? Given a feminism now ensconced within higher education as specialized or fractious scholarship, Susan Gubar's Critical Condition: Feminism at the Turn of the Century demonstrates that an invigorated concentration on activism and artistry can accentuate not the clinical or disparaging meaning of "critical" but its sense of compelling urgency and irreverent vitality. 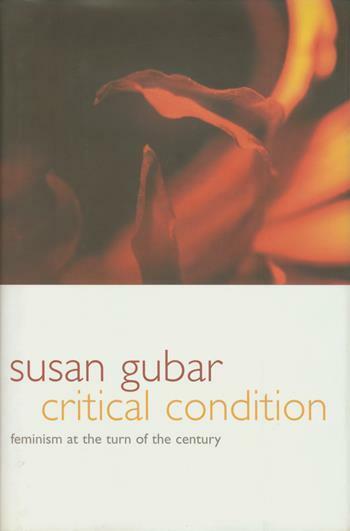 As a pioneer of feminist studies—and the object of some of the more rancorous criticism lodged against early feminist scholars—Gubar stands in a unique position to comment on current dilemmas. Moving beyond defensiveness produced by generational rivalry, the impasse propagated by smug deployments of identity politics, and the obscurity of poststructuralist theory, she claims that the very controversies that undermine feminism's unity also prove its resilience. Gubar begins by considering the volatile impact of gender on recent redefinitions of race, sexuality, religion, and class proposed by four important groups in contemporary feminism: African-American performance and visual artists, lesbian creative writers, Jewish-American women, and newly institutionalized female academics. She then addresses major divisions—including the rifts between various area studies and women's studies, as well as strains between generations—that both threaten and invigorate feminist inquiry. Gubar's forays into art and activism, politics, and the profession provide a sometimes distressing, sometimes comical, sometimes optimistic view of feminism emerging from a time of contention into a lively period of pluralized perspectives and disciplines.